Santa Ana, California (October 1, 1988) Rickenbacker International Corporation announces the acceptance of orders for the Susanna Hoffs Limited Edition. Susanna Hoffs, lead singer and song writer for the popular group, the Bangles, defined the appointments for this latest model. The hand made instrument offers a number of features which make it unique in the Rickenbacker product line, including the pickup configuration with one HB1, Rickenbacker's new humbucking pickup and two vintage type "chrome bar" single-coil pickups; 24 fret fully inlaid Rosewood fingerboard and bound body with "checkered" binding. Other features include semi-hollow body design and neck made from solid Maple and Rickenbacker's exclusive dual truss rod system. 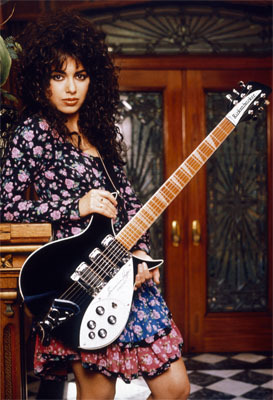 Susanna Hoffs has authorized the company to produce 250 of these unique instruments worldwide. Each guitar will be accompanied by an individually numbered Certificate of Authenticity. Certificate numbers will be assigned in the sequence that orders are received.